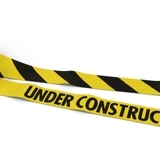 In their quest to finish what Kendall Williams calls “unfinished business,” the No. 7 NCAA seed New Mexico Lobos know who, where and when: the No. 10 Stanford Cardinal in St. Louis on Friday. The winner of that game is expected to advance and play No. 2 seed Kansas which has a opening game with No. 15 Eastern Kentucky. The Lobos are bracketed in the South Region along with No. 1 seed Florida, No. 3 Syracuse and No. 4 UCLA. The Lobos lost to Kansas 80-63 on Dec. 14 in Kansas City. There is a bit of irony in New Mexico’s first-round battle with the Stanford Cardinal of Palo Alto, Calif. The unfinished business that Williams refers to is the Lobos being upset in their first game in last year’s NCAA dance. New Mexico was knocked out of the 2013 NCAA Tournament by Harvard, considered one of the top academic institutions in the world. 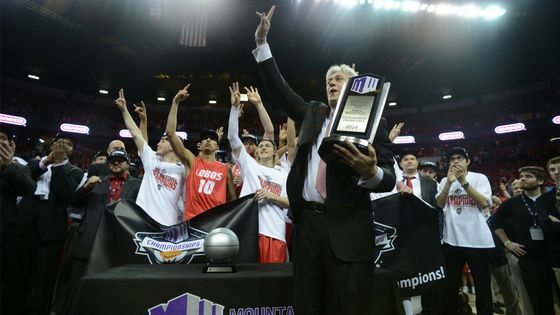 For the third consecutive year, the UNM men's basketball team won the Mountain West tournament title to earn the conference's automatic bid to the NCAA Tournament. UNM edged San Diego State, 62-56, to take the MW tournament title. UNM will play Stanford in the NCAA Tournament on Friday, March 21 in a second round matchup. 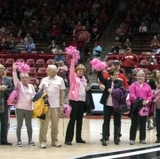 Photo courtesy of UNM Athletics. 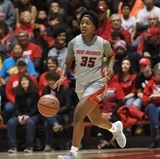 The Lobos grabbed the Mountain West’s automatic NCAA bid by defeating San Diego State 64-58 in Saturday’s MW Tournament championship game and also beat the Aztecs in The Pit 58-44. It was New Mexico’s third straight MW tournament title. However, the Aztecs, who beat UNM in San Diego, grabbed the No. 4 seed in the West Region and get another shot at a New Mexico team. 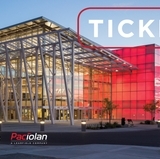 The Aztecs are matched against New Mexico State in Spokane, Wash. The Lobos are making their 15th appearance in the NCAA Tournament and their first under first-year UNM Coach Craig Neal. UNM has an 8-15 NCAA mark. The Lobos entered the 2013 tournament with a No. 3 seed which tied the school mark. The No. 3 seed Lobos lost in 2010 to No. 11 seed Washington and UNM also was a No. 3 seed in 1997. The Lobos last reached the second round in 2012 as a No. 5 seed and lost to eventual Final Four participant and 4th-seed Louisville 59-56. The Stanford Cardinal will carry a 21-12 mark into NCAA play. They went 10-8 in the tough Pac-12 and received an at-large bid into postseason play. Stanford is 21-15 in the NCAA Tournament and is making its 17th appearance. The Cardinal have not been in the NCAA bracket since 2008 when the Cardinal entered as a No. 3 seed and lost in the Sweet 16 to Texas. The Lobos have played the Cardinal three times with Stanford holding a 2-1 lead with the last meeting in 2001-02, an 81-66 Stanford win in The Pit. Stanford picked up two wins last week in the Pac-12 Tournament in Las Vegas before being knocked out by UCLA. They went 3-2 against Top 25 opponents with wins over UCLA (83-74), at Connecticut (53-51) and at Oregon (82-80). The Cardinal had four players placed on the All-Pac-12 team with Dwight Powell and Chasson Randle on the First Team. Josh Huestis made the five-member All-Defensive Team and Anthony Brown was the league’s Most Improved Player. This is the first time the Cardinal had two First Team members since the 2005-06 season. The Cardinal are close to New Mexico in height as they start 6-11 Stefan Nastic and can bring in two 6-10 players and two 6-9 players off the bench.